Hi, everyone. 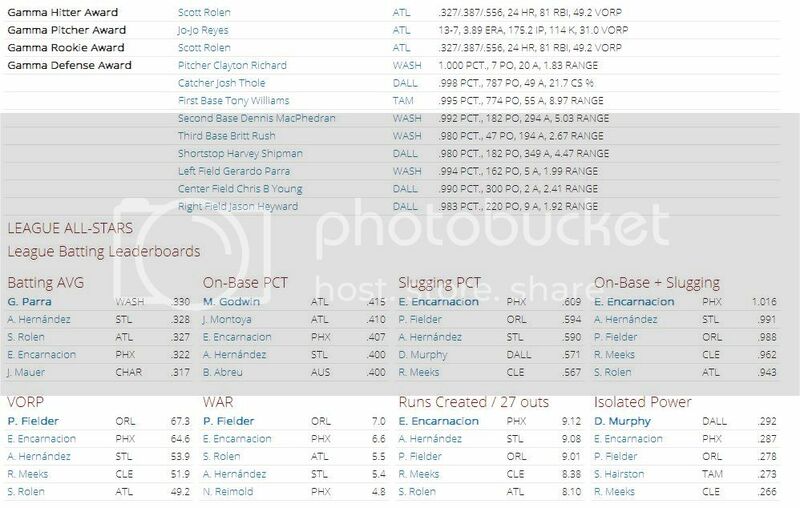 I have left a dynasty of epic proportions on the back burner because my computer cannot handle it or OOTP cannot handle it. Maybe a combination of both. 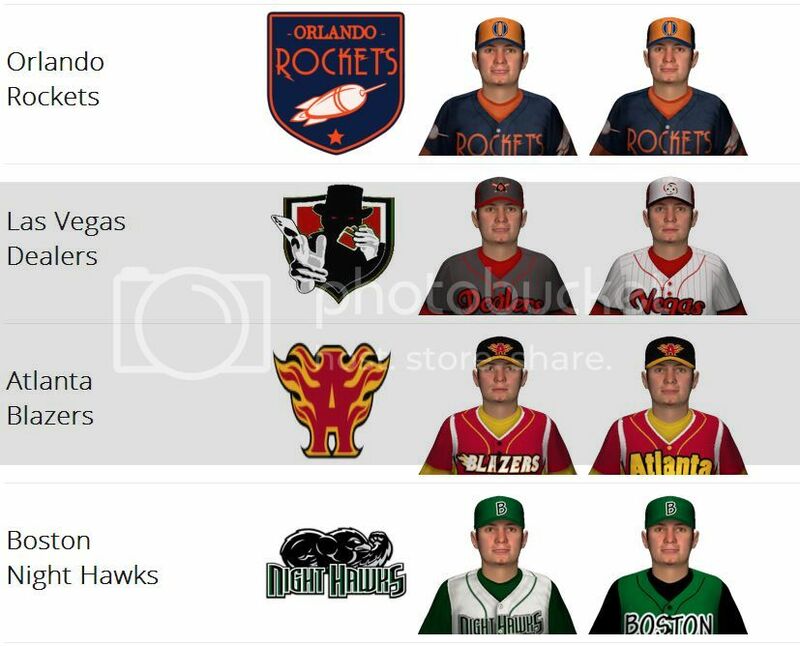 Unfortunately for me, I spent dozens of hours making uniforms, creating histories, and all kinds of things for that world only to have it blow up OOTP 15 for me multiple times. It was a sad day, but I finally decided I would retry once I buy a brand new, state-of-the-art gamer's laptop. 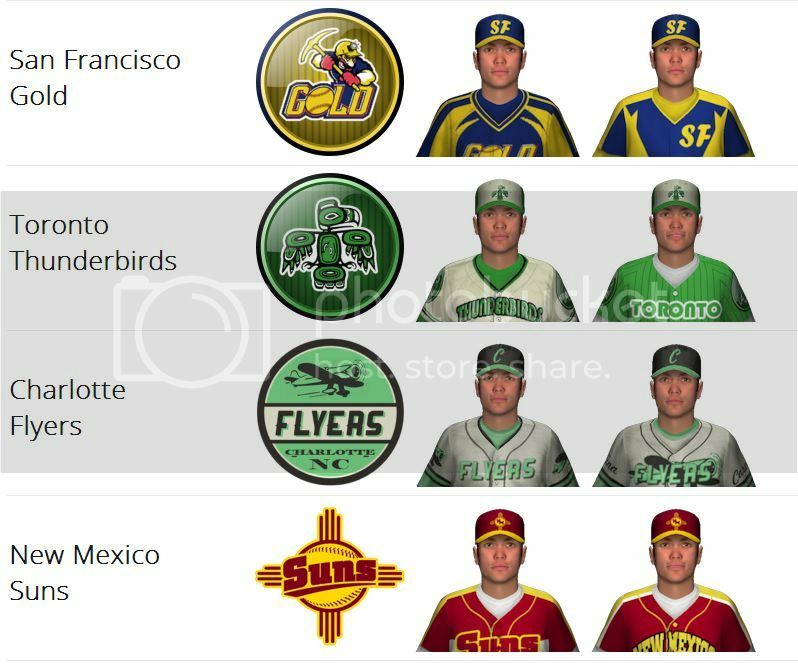 That probably won't happen before the summer of '16, so in the meantime, here is a doable dynasty I have created with some of the franchises from my epic world, basically concentrated on North America, with the U.S. and Canada getting first dibs. 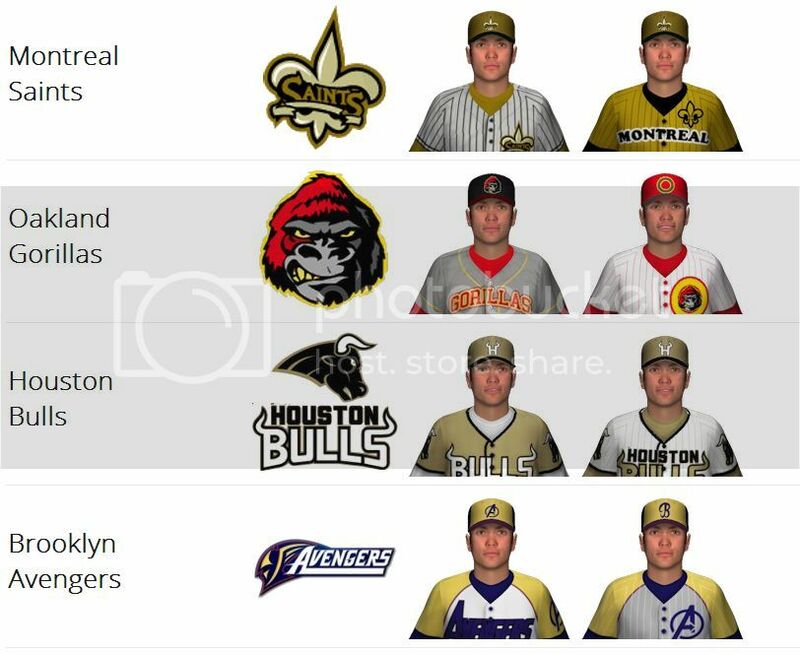 48 teams divided into four leagues of 12 teams apiece. 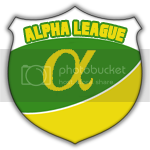 The Alpha League represents the top league with more money available in the budget and a higher league reputation (10). 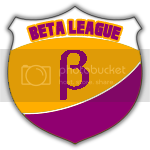 The Beta League as the second best league and a league reputation of 7. 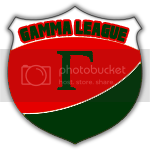 The Gamma League with the third best money and league reputation (4). 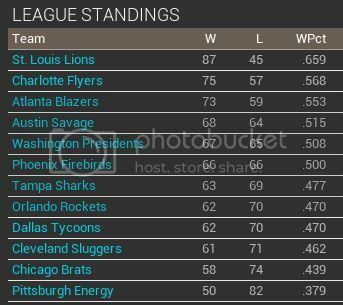 The Omega League where only the teams struggling the most play. 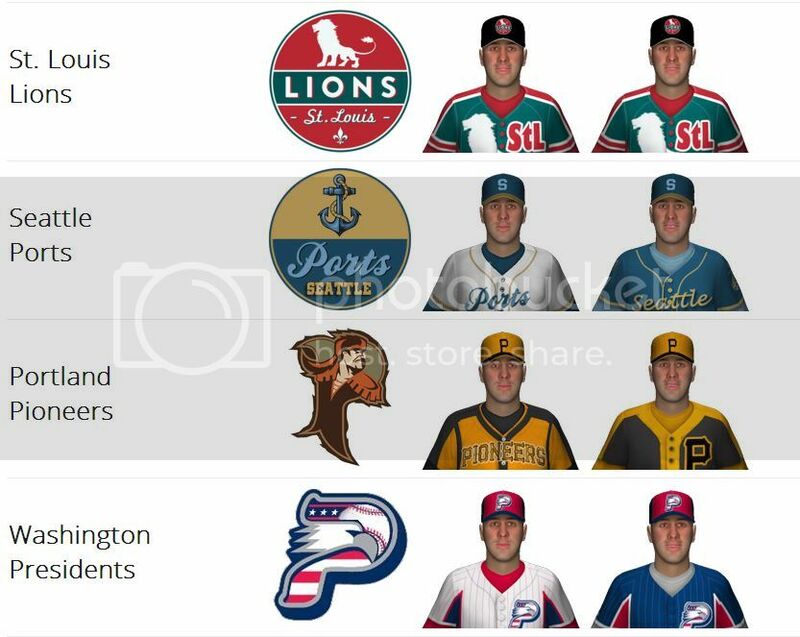 The league reputation there is 1, and teams who dwell in the OL for FIVE consecutive years without being promoted to the Gamma League are forced to fold their franchise for a city waiting in the wings. Cities awaiting franchises will be revealed later when there are teams in danger of folding. 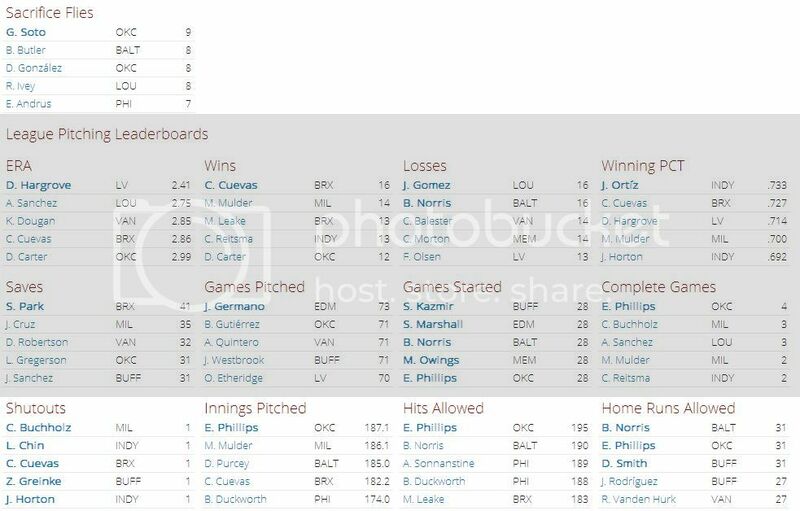 Tournament of Champions: This is the post-season tournament that is considered to be the true championship tournament. 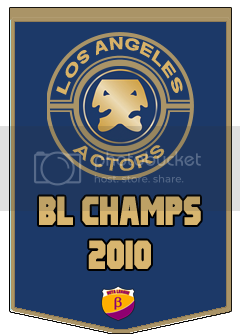 There are ten teams involved: the top four teams of the Alpha League, the top three teams of the Beta League, the top two teams of the Gamma League, and the regular season champion of the Omega League. The first round consists of a three-game series. The quarterfinals, semifinals, and championship are five-game series. 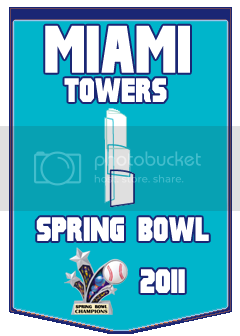 Spring Bowl: This is the first tournament of the season and takes place in February. 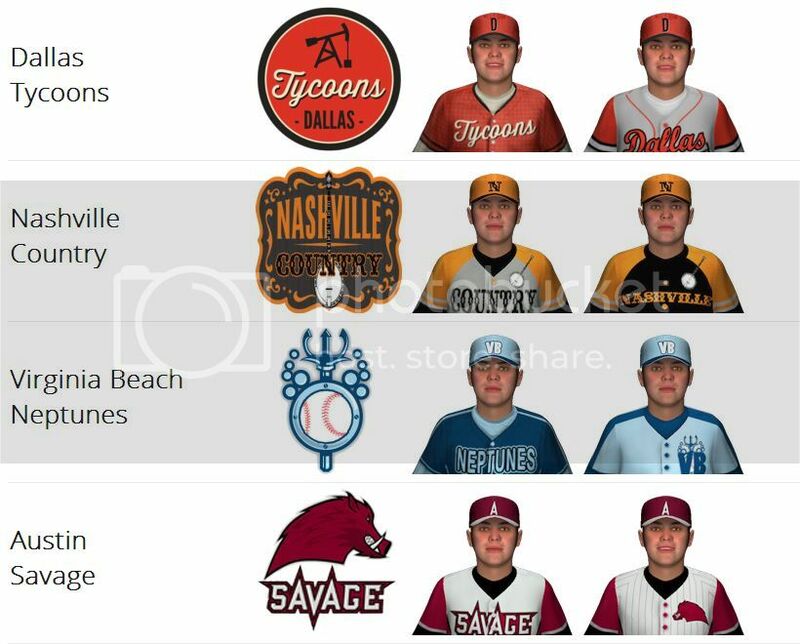 As of 2014, the tournament is a 24-team tournament allowing the top six teams of each league (basically allowing teams with winning records in) in a double elimination tournament. 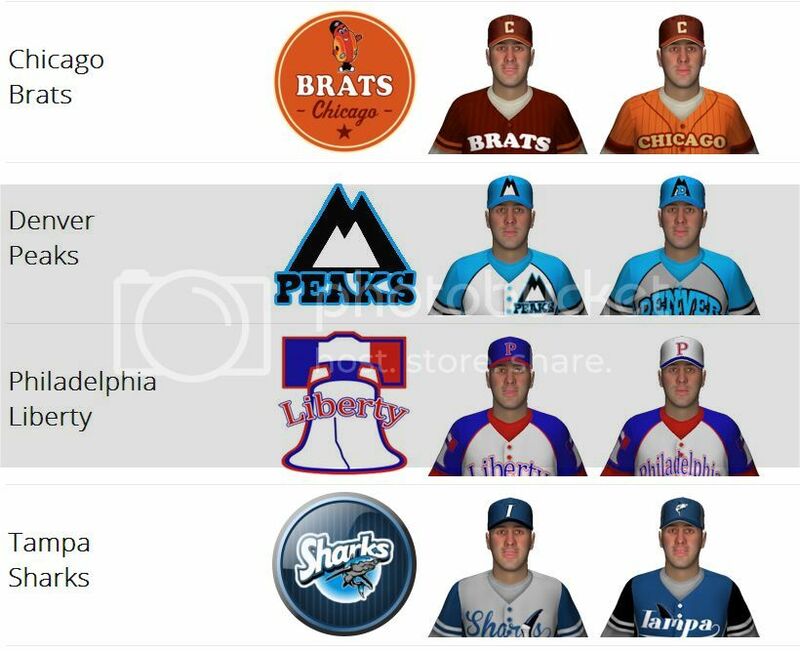 Battle for the Diamond Trophy: The top four teams of the Alpha League take on each other in a championship playoff. 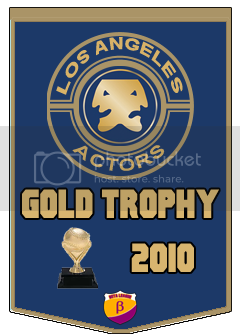 The winner proves to be the best of the Alpha League for that season. 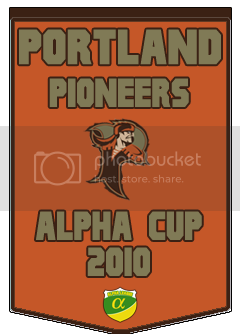 Alpha Cup: This is a one-round series between the fifth and sixth place teams of the regular season in the Alpha League. 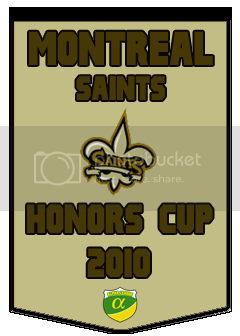 Honors Cup: This is the battle for survival in the Alpha League as each of the final six teams are on the chopping block to be demoted to the Beta League. The last two teams survive into the next season as well as battle it out in a three-game series and the Honors Cup. Battle for the Gold Trophy: The top three teams face off in the Beta League championship tournament. The second and third place teams meet in the first round for the right to meet the first place team in the championship series. 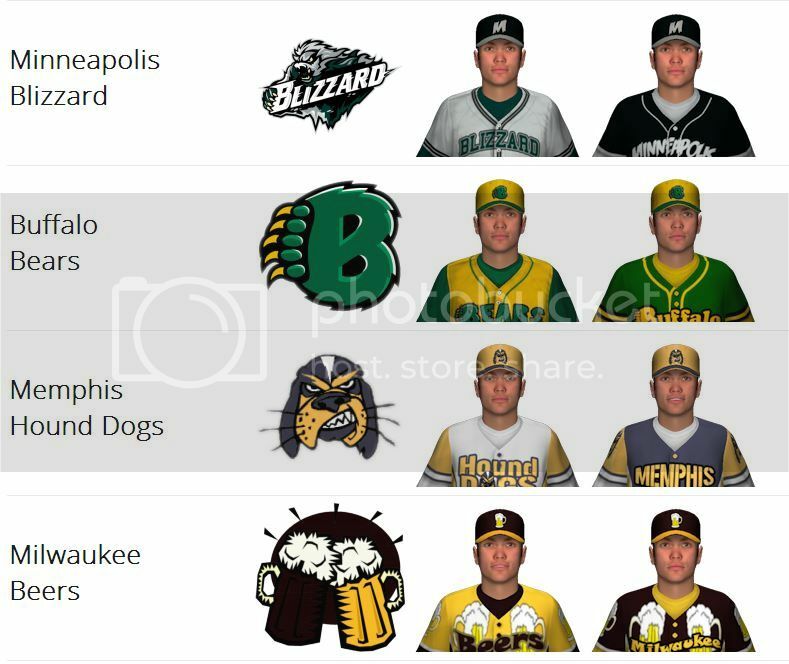 All three teams are automatically promoted to the Alpha League. 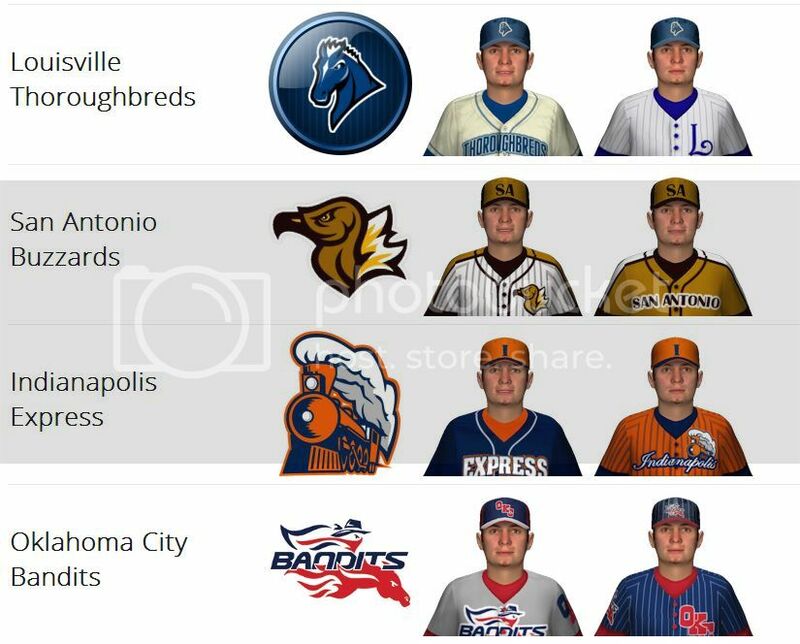 Beta Cup: The fourth through seventh teams meet in a two-round tournament for the right to be the fourth team to be promoted from the Beta League. 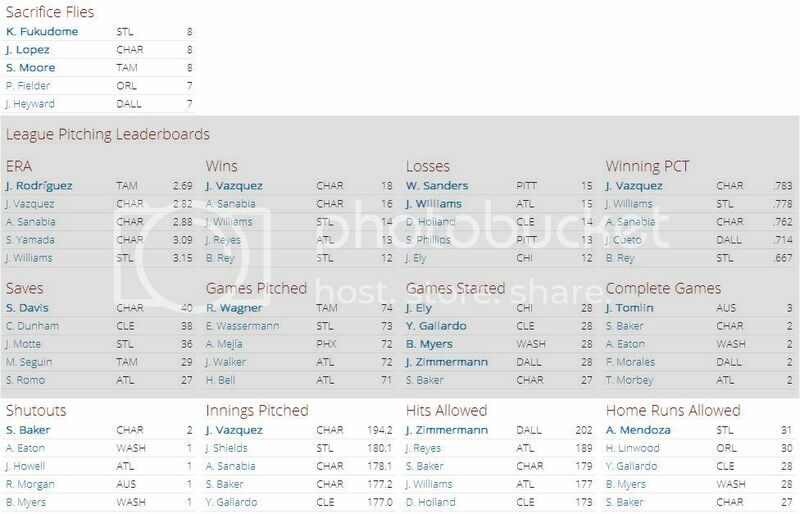 Winner moves on to the Alpha League; losers remain in the Beta League. 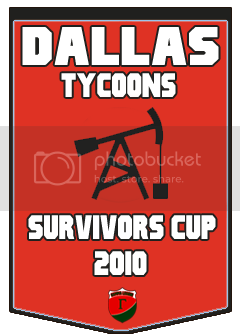 Beta Survivors Cup: The bottom five teams face off in a race for survival. Four teams drop to the Gamma League. 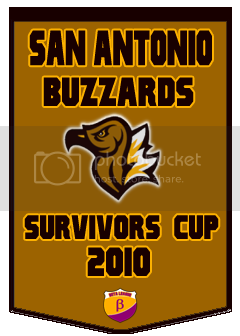 One team wins the Beta Survivors Cup to remain in the Beta League for at least another season. 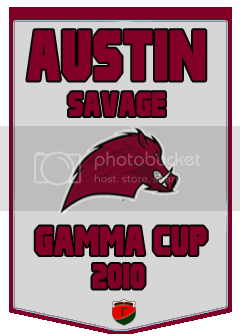 Battle for the Silver Trophy: The top two teams of the Gamma League meet in a seven-game, winner-take-all championship series. 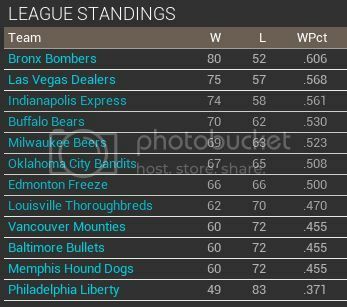 Both teams get automatically promoted to the Beta League. Gamma Cup: The third through sixth place teams meet for the right to claim the Gamma Cup. The two teams that meet in the Gamma Cup Series are promoted to the Beta League. Gamma Survivors Cup: The final six teams meet in a survival to remain in the Gamma League. Only the winner of the Gamma Survivors Cup remains. 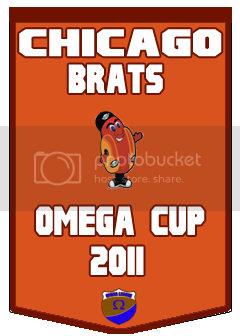 All other teams drop to the Omega League where they have no choice but to battle from the basement. 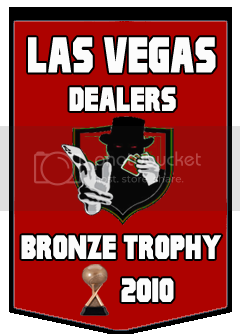 Battle for the Bronze Trophy: Just like the Gamma League, only the top two teams meet up in this seven-game series for the right to claim the Omega League title. Both teams are automatically promoted to the Gamma League. Omega Cup: The third through tenth seeds meet for the right to move up. The two teams that meet in the final are automatically promoted to the Gamma League, with the winner of that three-game series taking home the Omega Cup. There is also a series for the other two semifinalist teams with the winner of that series being the fifth team promoted to the Gamma League. 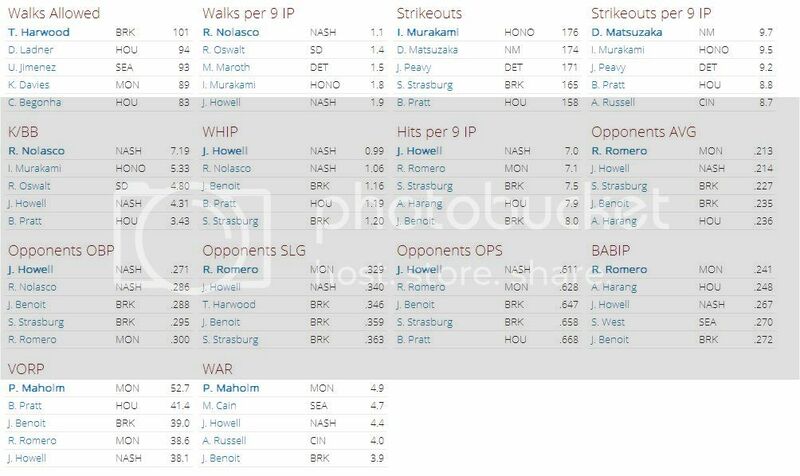 The regular season is 132 games long with each team facing the other teams in their league 12 times (six home and six away games in four total series). 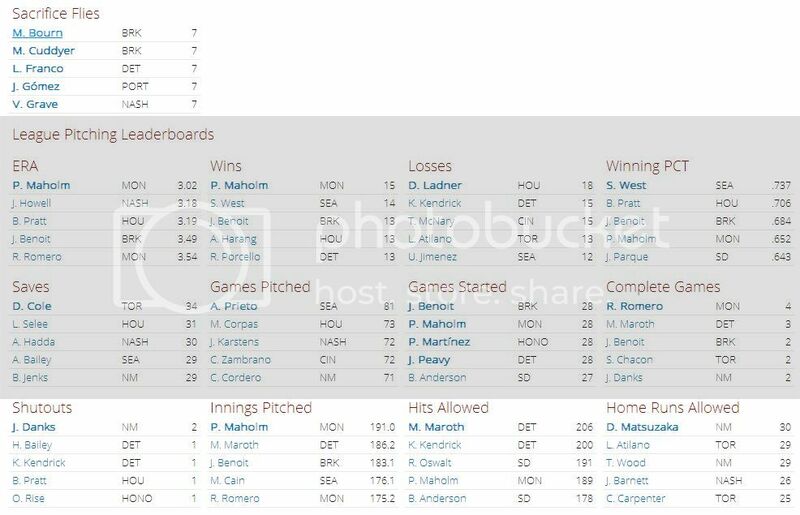 There is no DH allowed in any of the leagues. 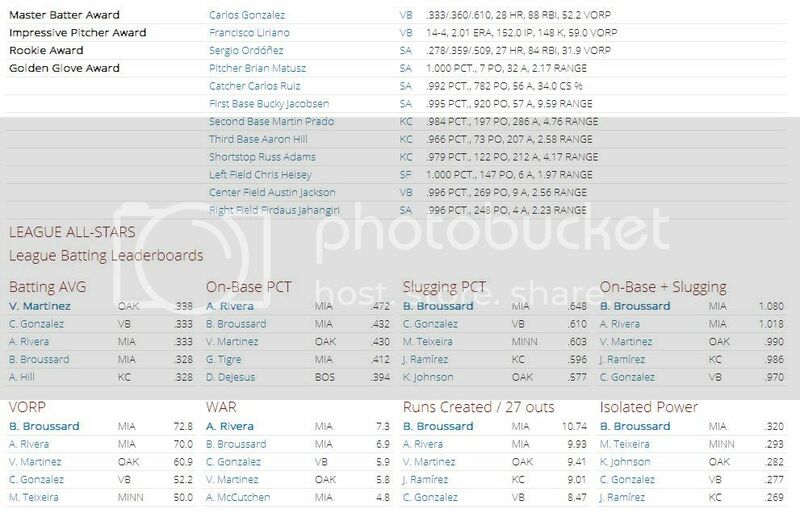 Teams have a 25-man active roster with a 15-man reserve roster. 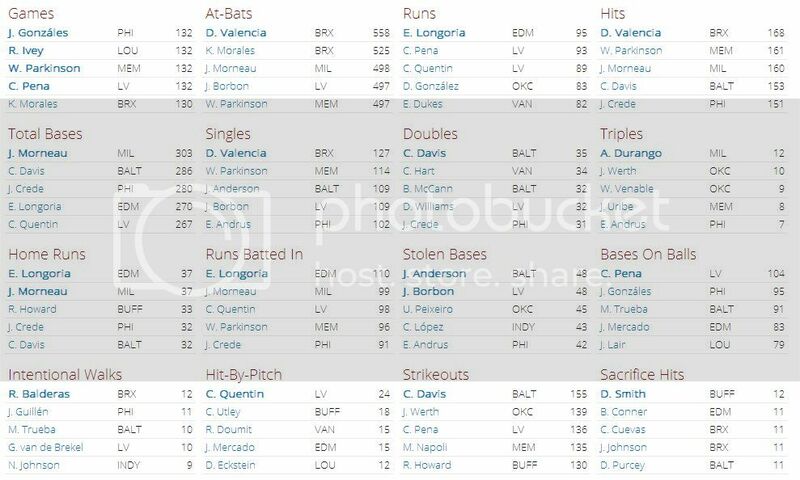 There is a mixture of real and fictional players. 2014 when he is hired as a GM of one of the franchises. That is where the action of this dynasty begins. Some time later, he may move on to another GM spot, but he will eventually be offered the job as commissioner where (I) he will reemerge in God mode. In January 2007, the Korean Baseball Organization came calling. They heard of my work in the States, and they wanted me as an important liaison between the States and Korea. 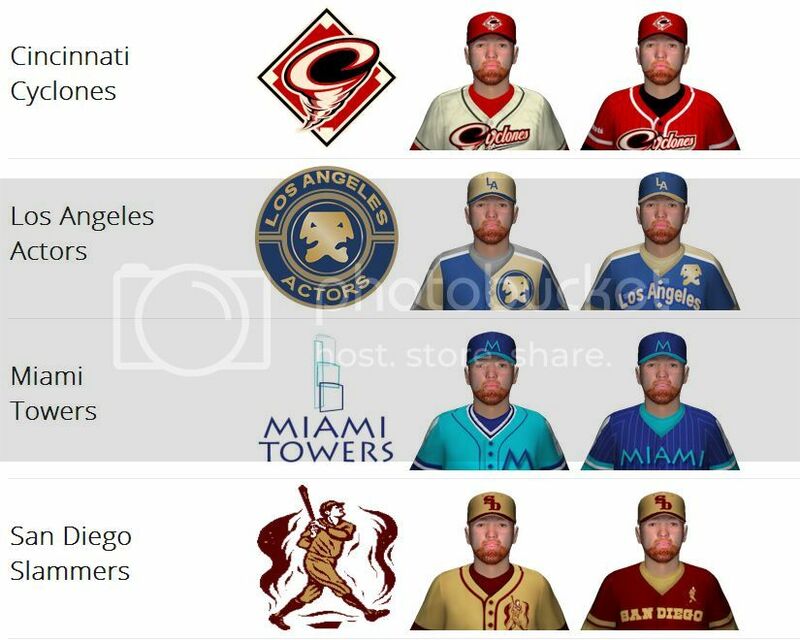 Considering my options in the States with the MLB now defunct and a new league modeling the English Premier (Soccer) League hoping to start up, it was a tough decision. From August 1999 until November 2006, I worked in the Majors. 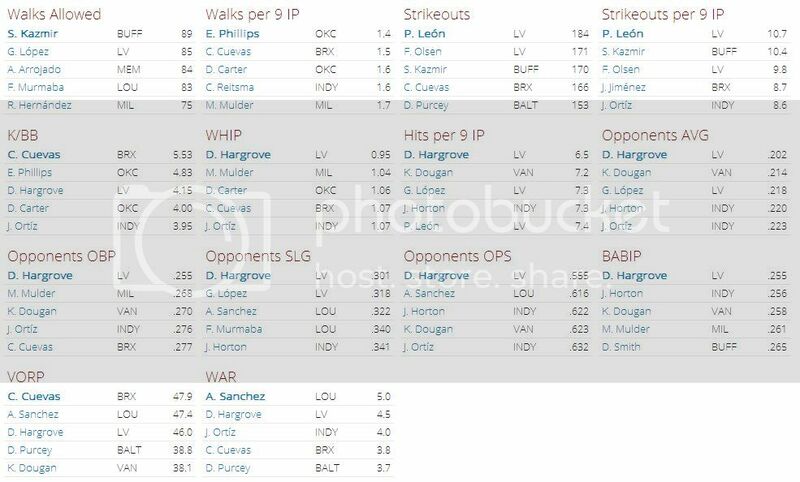 At first I was an area scout, finding guys around the Southeast for the Indians from 1999-2001. After two years, I got offered a job as an assistant scouting director of the Cubs. That was a nice promotion, but we struggled a lot in that time, so I was dismissed in just under 18 months along with a few other guys. Seven months later, in September of 2003, I got my last job in the Majors as assistant GM of the Mariners, which put me on the KBO radar since there was a huge contingency of Korean fans in Seattle. The Majors were dying. 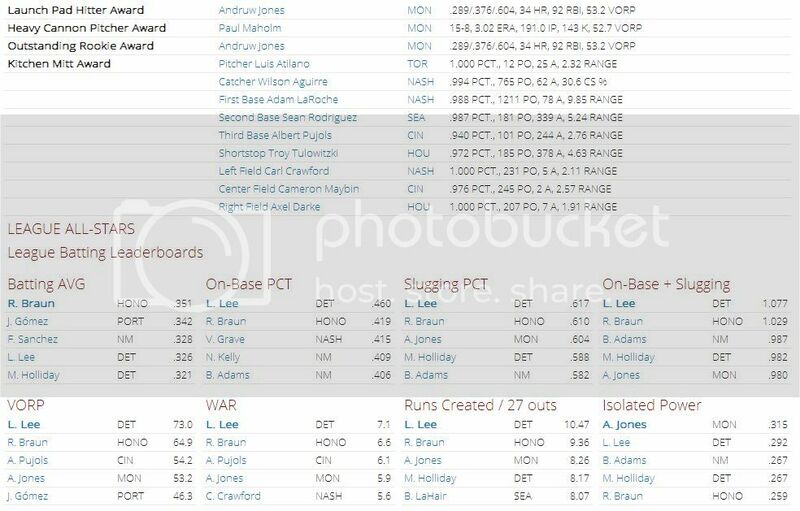 After the Steroids Era, people just became apathetic. While the NFL and NBA were flourishing, the MLB was making terrible decision after terrible decision, leading to decreasing attendance and TV viewers. By early spring of 2006, the MLB announced that it would be closing its doors. Losses of people doesn’t matter as much as losses of sponsorships. And those sponsorships went elsewhere. Owning a MLB team became a losing proposition. That’s when entrepreneur Chet Needham’s dream of a competitive, no-holds-barred style of baseball took hold. That kind of league could recapture the American interest, he said. He said he would love a gladiator’s arena of baseball where every decision, every game, could make a huge difference. However, instead of going full Roman, he also went Greek. The interview in Korea was much different than anything I had ever experienced. I sat in front of a room of about 25 men, all dressed in shiny suits. One man was the interviewer, the man asking all of the questions, probably because he was the best English speaker of the group. The interview was short. “Do you know Pak Chan Ho?” Mr. Kim asked. All of the men were a Mr. Kim or Mr. Lee or Mr. Kwan or some other Mr. name. 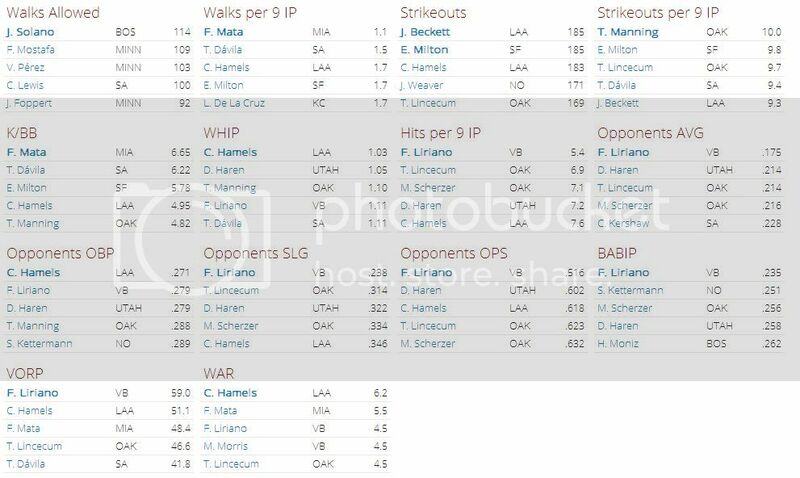 “Yes, he’s a great pitcher,” I said. “Very very good pitcher,” he said. They all nodded in approval. “Do you know Cha Seung Baek?” he asked. “Yes,” I said. “He was with us in Seattle.” They were all happy. “You want to live Korea?” he asked. “Sounds great,” I said. I was hired on the spot. 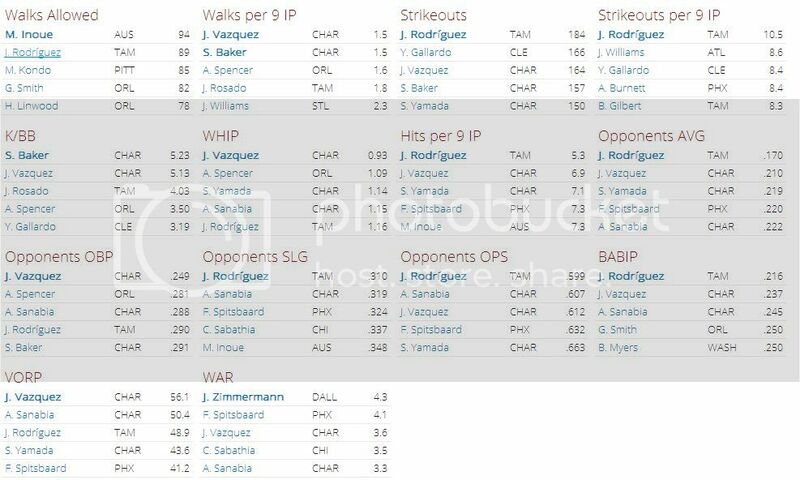 I didn’t make a lot of big signings, and we had a lot of ridiculous restrictions on who we could go after, even after the MLB had folded. 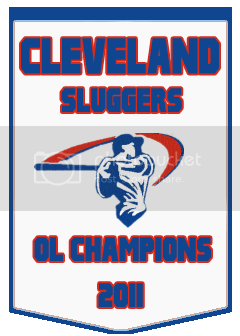 In short, I knew after fewer than two years that I had made the wrong decision not to take a job in the head office of the newly formed Champions Baseball Association. On September 19, 2013, I resigned from my job in Korea. Several organizations of the Champions Professional Baseball Association had contacted me about moving into a general manager position in their organization. There were lots of good places to choose from, but it came down to two choices. 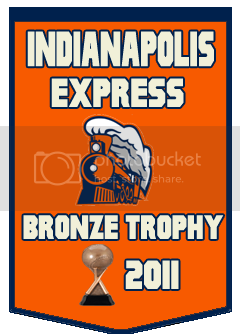 One was my hometown team, the New Orleans Gators. 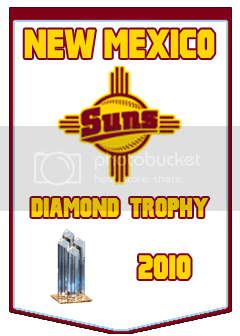 The other was a job in a place where I knew little about, the New Mexico Suns organization in Albuquerque. 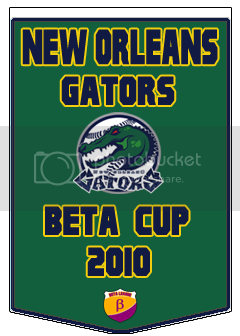 In the end, I decided to turn down the New Orleans Gators because they had just been promoted to the Alpha League. To me, there was nowhere to go but down. 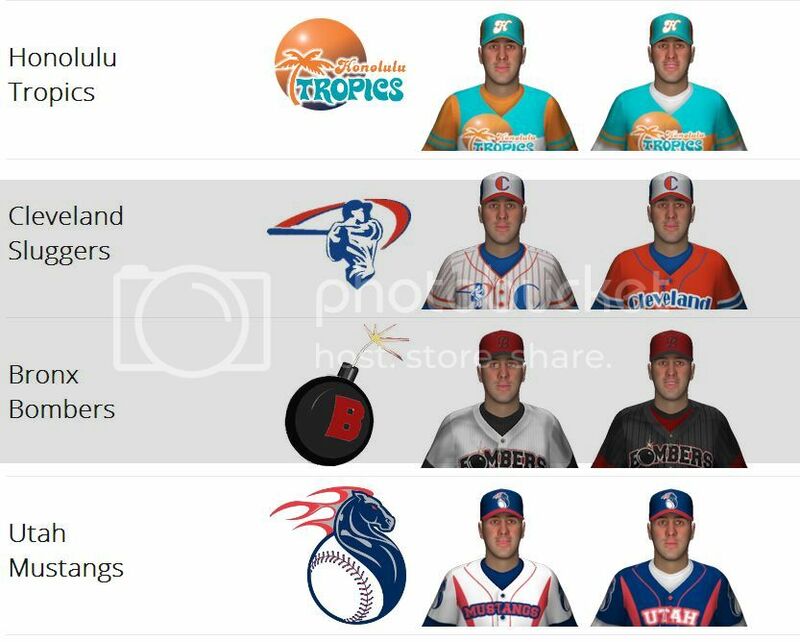 On the other hand, New Mexico had just survived in the Beta League. They had a few cogs that gave me hope they could be really good now and for years to come. So, I took the New Mexico job. 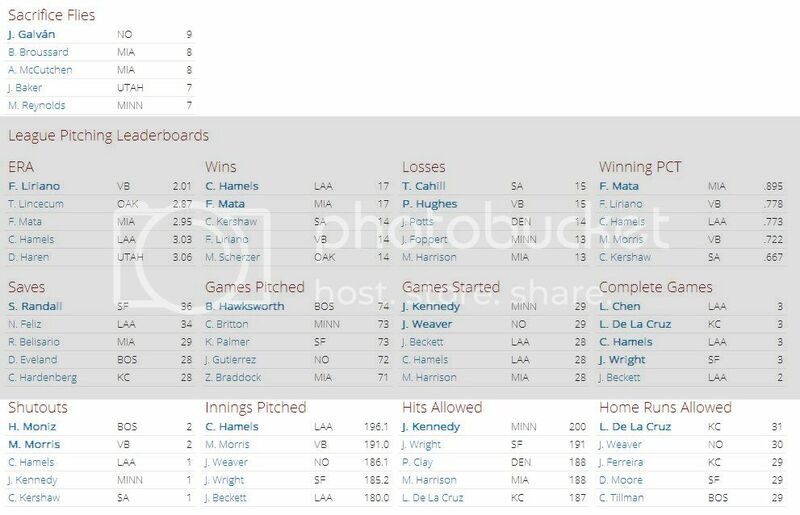 From 2010 until I took the job in October 2013, the Champions Baseball Association was comprised of four leagues of 12 teams. These 48 teams competed for a number of cups, bowls, and trophies throughout the season, with the ultimate prize being the winner of the Tournament of Champions where 10 teams would participate for the title. Here is the basic breakdown of how the league was formed. By 2008, the 48 teams had been established and were building staffs, as well as recruiting international talent. All 48 teams at that time were considered equal, depending on how much money they were willing to spend on players. At the beginning of the 2010 season, the teams competed in the Placement Series. Through random pairings, 24 five-game series were scheduled. The winners of those series moved on to the winners bracket. The losers went into the losers bracket. 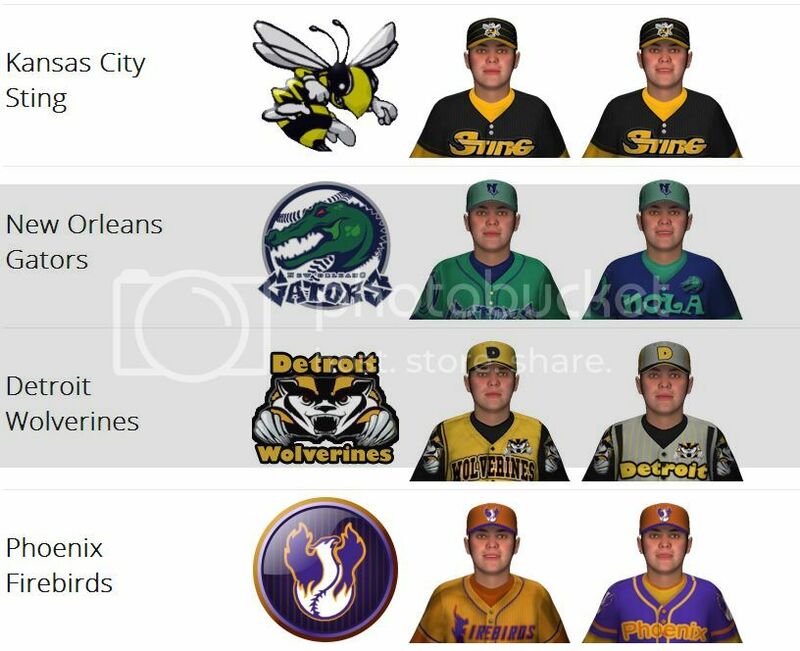 In the next round, the 12 winners of the five-game series went on to the Spring Bowl Tournament and were placed in the top level of the CPBA, the Alpha League. The losers of that round were placed in the Beta League. In the losers bracket, the winners of the next series were placed in the Gamma League. 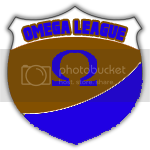 The losers were placed in the lowest league, the Omega League. These comprised the four Greek leagues. 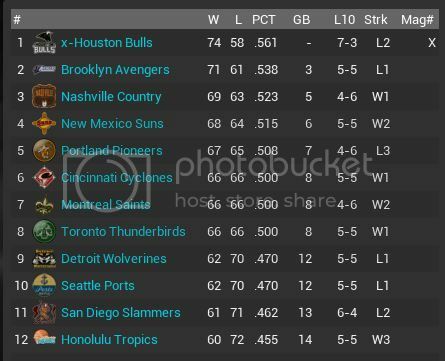 For the dynasty, I plan to focus a lot on the New Mexico Suns while my main character is the GM there. However, for anyone following a particular squad, I will be sure to give them some time, too starting in 2014. For every tournament, pennant race, and playoff, I plan to give that some attention, too. The 2014 season may run a little slowly, but I am not planning to manage the games. So, most of the progress there will be from a GM's perspective with a wider view at the entire CPBA. So let me know which teams you are pulling for, and I will be sure to keep you keyed in on their progress! The 12 winners of the Alpha-Beta Series moved on to the inaugural Spring Bowl. 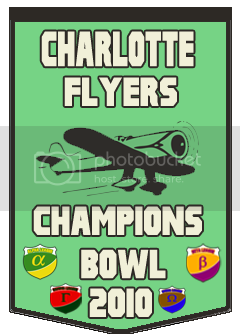 Though the rules for teams in subsequent years would be different, only a team that had won its two series for the rights to play in the Alpha League could participate in the first-ever Spring Bowl. Teams were randomly selected for seeding in the double elimination tournament. 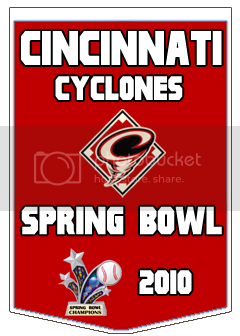 The Cincinnati Cyclones were the first-ever winners in the newly formed CPBA. Memphis had a winning record against both Baltimore and Vancouver, so #9. 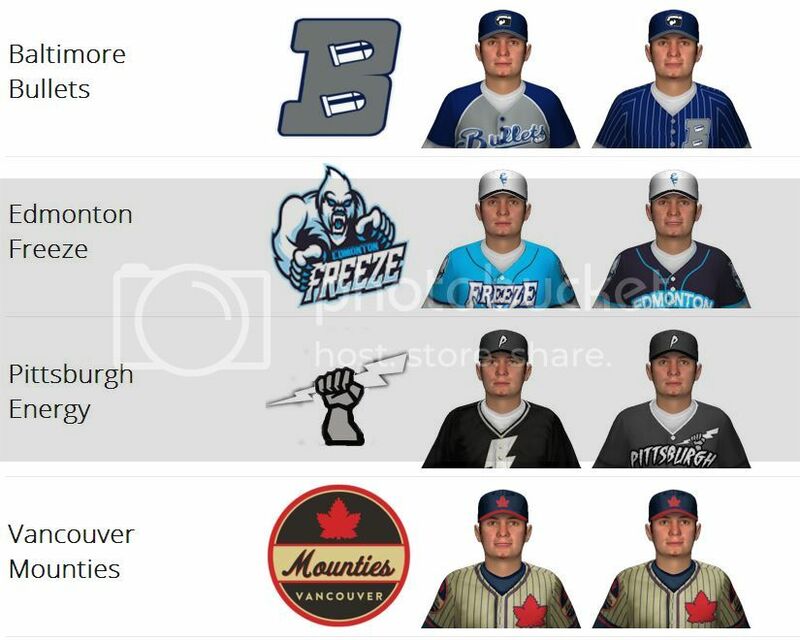 Vancouver had a winning record against Baltimore, so #10. 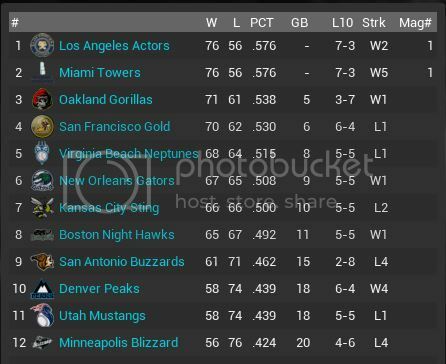 Los Angeles won the season series over Miami for #1 seed. Utah won the season series over Denver for #10 seed. Cincinnati had the best overall record among the three teams for #6 seed. 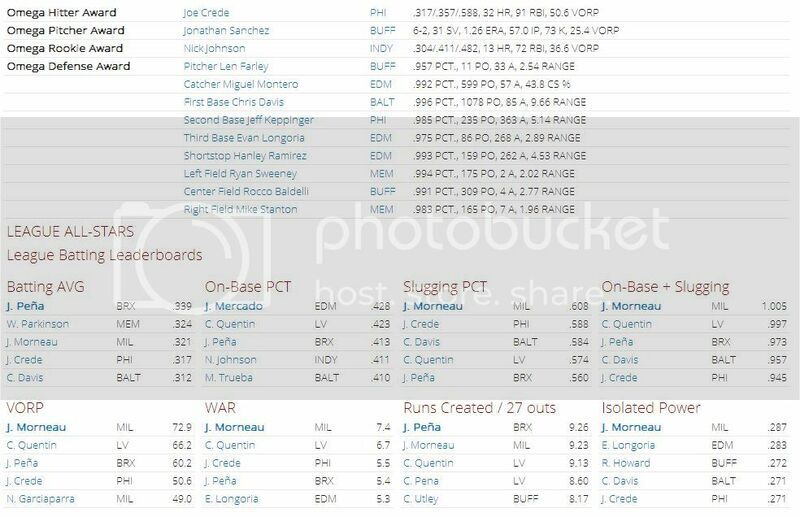 Montreal won the season series over Toronto for the #7 seed. Detroit won the season series over Seattle for the #9 seed. 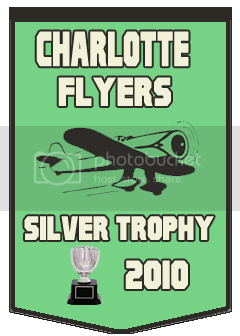 The Charlotte Flyers from the Gamma League won it as the ninth seed. I find the light blue on white to be hard to read, so I may change to the dark skin soon. I just like it better for readability. 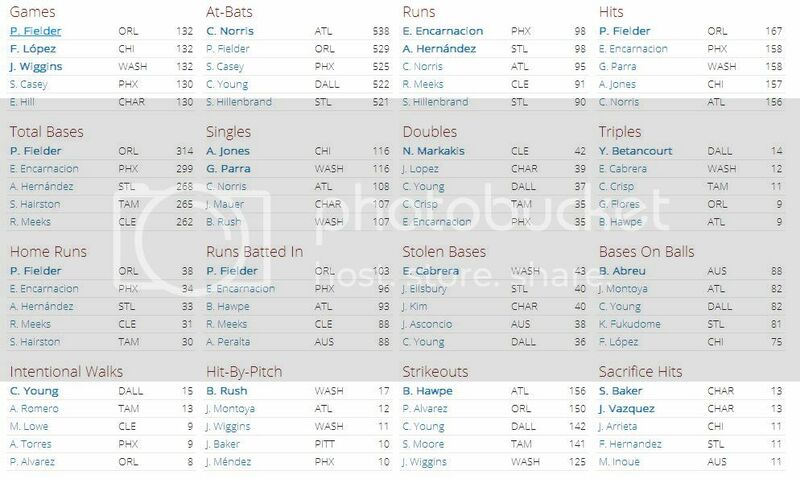 Anyway, for now, OOTP 15 skin stats. 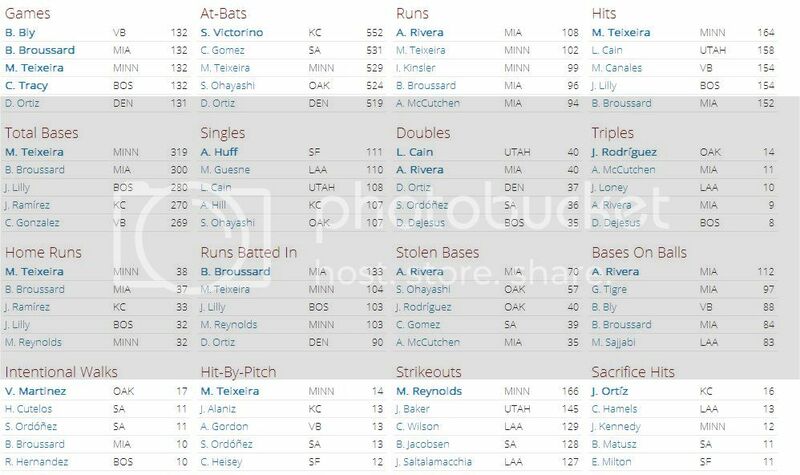 In the 2010 season, I think I forgot to limit who could win the rookie awards. I think I got that right through manual voting starting in 2011. Please forgive the unbelievable "rookies." 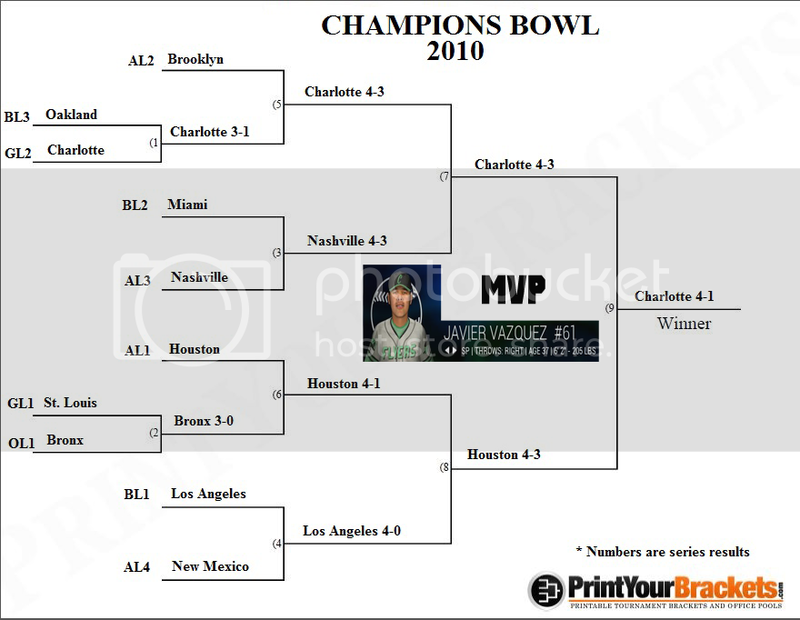 The 2011 Spring Bowl changed its format to being a seeded tournament of the top four teams of each league from the 2010 season for a total of 16 teams. 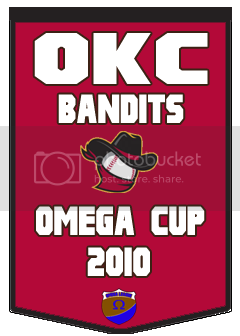 Seeds were ordered starting with the 2010 Alpha League pennant winners all the way down to the fourth-place finisher in the Omega League. Miami took advantage of the New Mexico pitching staff to take the last two games and begin their season as the early favorites. 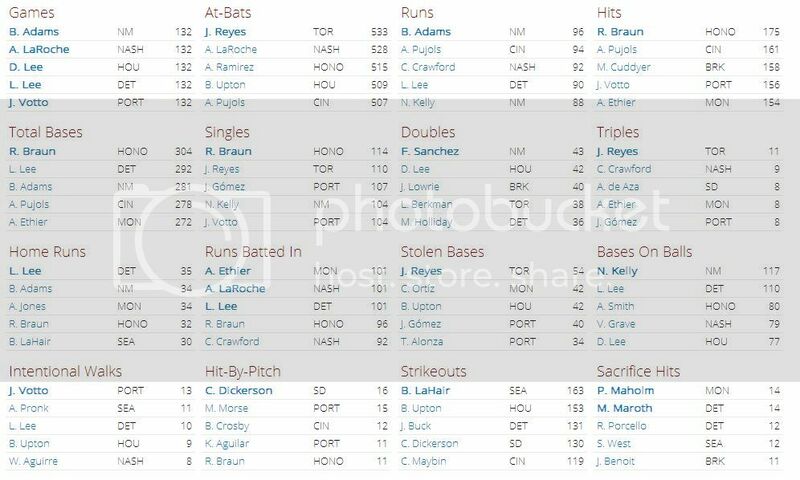 One thing that I don't think I have mentioned before, but may be relevant in future seasons is that there is an ultimate season award that I am currently calling the Triple Crown. 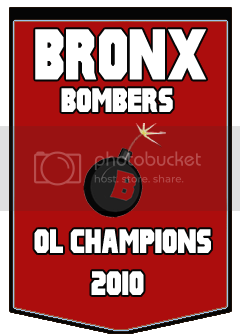 It is for a team that wins the Spring Bowl, their league's Trophy, and the Champions Bowl. 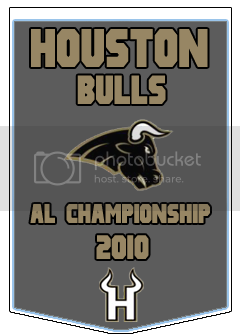 If any team can accomplish that, I plan to have certain future ceremonies for a Hall of Fame type of presentation. 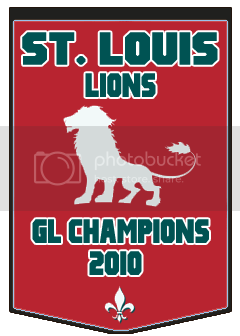 However, since the league is only in its second season here, I won't worry too much about 50 years into the future. 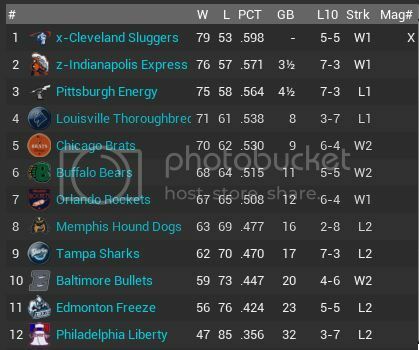 Indianapolis and Pittsburgh had identical season records, so they met in a one-game regular season matchup for the right to meet Cleveland in the battle for the Bronze Trophy. Indianapolis won the game 6-1.